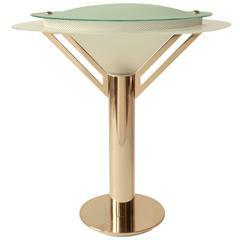 Modern, elegant Minimalist table lamp designed by Paolo Piva in very good condition. Measures: 20.5 inches high. Regular two pin halogen light bulb rated at 20 watt. Switch on cord. Come with original box. Post modern lamp by Stefano Cevoli for Vermezzo in rare gunmetal finish. This perfect desk lamp is made of gun finish metal. Arm and light are adjustable and can fully rotate in either direction. 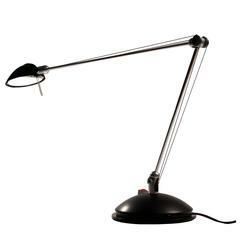 Highly adjustable Italian desk lamp both designed and produced by Stefano Cevoli in the 1980s. It stands a meter tall when fully vertical and the counterweighted swingarm is 80cm. 1980s halogen counter balance desk lamp for Fase. Good and working condition consistent with age and use. 1980s floor lamp inspired by manufacturing robot arms. 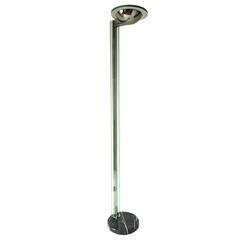 Featuring a two-stage dimmer and a telescoping upper arm. The light can fully rotate on its arm making it very flexible.